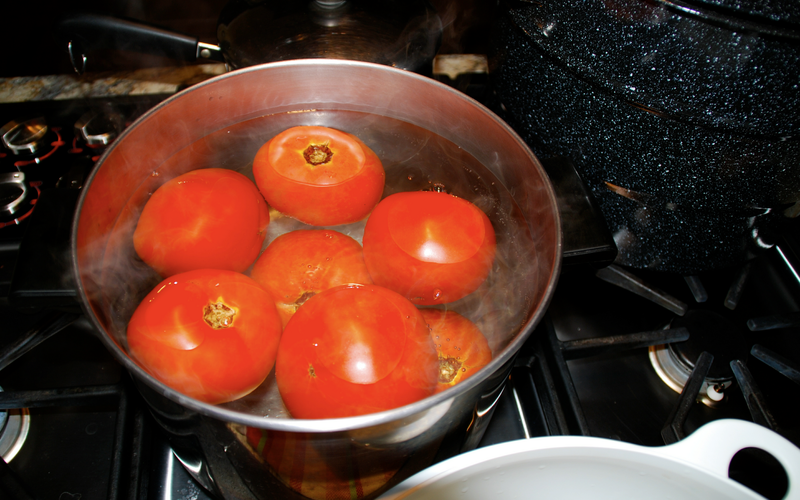 Wash your tomatoes while bring a large pot of water to a boil. Prepare a large bowl of ice water for par-boiled tomatoes. Cut an x on the bottom of each tomato and place in hot water for 30 seconds, then into the ice bath to stop the cooking. Continue until all tomatoes have been through this process. Now core and peal tomatoes. Wash all jars, lids and rings. You can either boil the jars, lids and rings or process through your dishwasher. They just need to be sterilized before use. (I do this ahead of time). 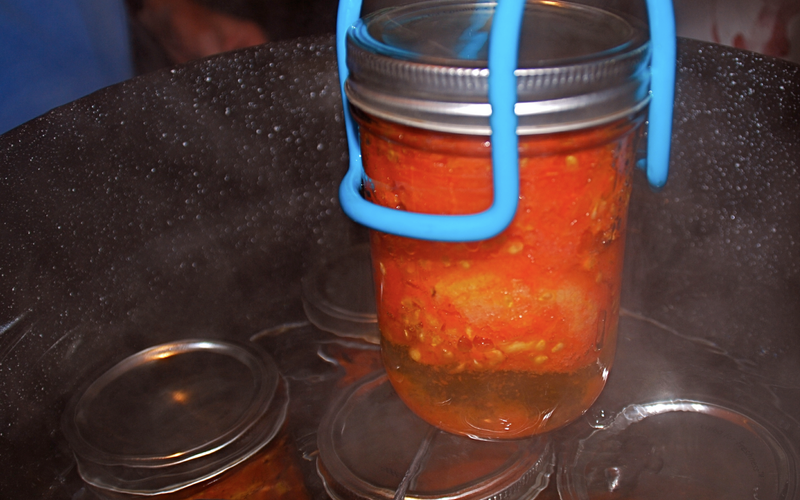 When jars are ready, put tomatoes into the jars pressing down to get as many in as you can leaving a 1 inch head space. 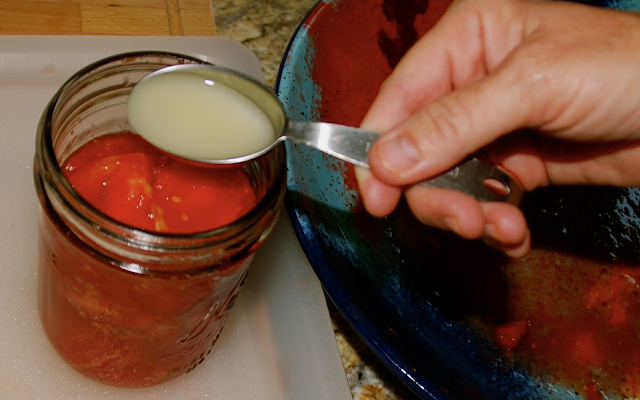 Now add 1 tablespoon lemon juice to each pint jar (2 tablespoons for quart jar). Wipe clean the edges around of the jar. 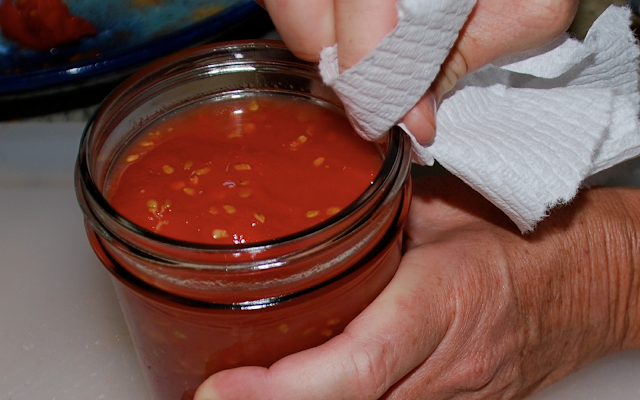 With a plastic knife, poke down around the inside edge of jar releasing any and all air bubbles. When you see no bubbles add the lid and ring and tighten slightly. Do not over tighten! Now they are ready to go into the caner. 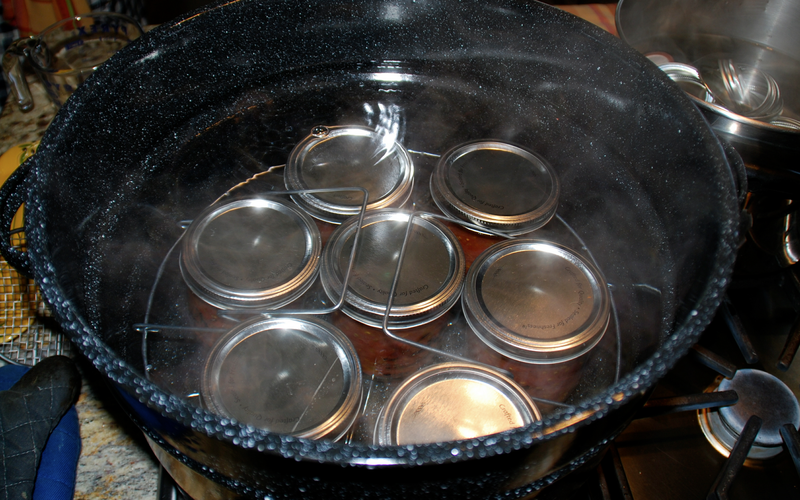 The caner should have a rack and boiling water in it before adding the jars. If your pan does not have a rack, improvise, use jar lids in the bottom. Just make sure your jars do not touch the bottom of the caner. Now pour more hot boiling water of the top of the jars at least 1-2 inches over the top. Bring water to a boil, lid on the pot and start processing for 40 minutes from the time the pot begins to boil. Keep an eye on the pan as it tends to boil over and you will have to re-adjust your heat. When the 40 minutes are up remove the lid form the pan and slowly remove each jar to a flat surface covered with cup towels. Let them rest 12 hours or over night. You will hear them pop and hiss a little, do not be alarmed, this is normal. They are sealing the lids. When totally cool, next morning, tighten the rings if they are a little loose. This is our second year of canning tomatoes and look how many we have this year. 16 quarts and 13 pints! Figures out to be around 64 pounds of tomatoes! Where did we get them? We went to our farmers market and asked for the really ripe tomatoes and the ones they can't sell and make us a deal on them. We purchased them for around $30. We did have to get rid of the bad spots and threw away about 10% but we have a lot of tomatoes for the winter.